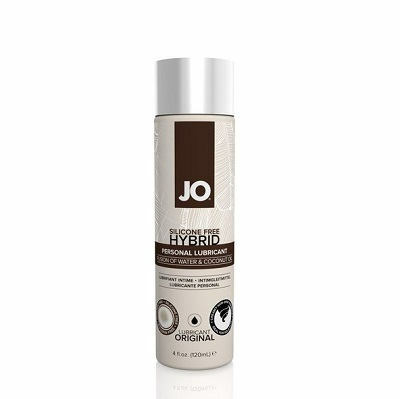 JO Silicone Free Hybrid personal lubricant is a fusion of water & coconut oil. JO SILICONE FREE HYBRID is a personal lubricant designed to supplement the body’s natural lubrication. The silky smooth texture and delicate coconut aroma provide the perfect bedroom addition for an intimate escape. The luxurious creamy white lubricant offers a great triple play formula. Ideal for solo, couple and/or silicone toy play.